It’s not quite halloween yet, but…..BOO! Exoplanets are mysterious, bizarre and some are just a little bit scary. With the help of the Kepler space telescope and advanced ground-based exoplanet-hunting techniques, for the first time we’re directly observing a veritable menagerie of alien worlds, making this a historic time in human history. Through exoplanetary studies, we’re beginning to even understand our place in the Universe. However, despite all the excitement, many of these alien worlds seem downright weird. Some are being called “impossible,” while others sound like they belong in the storyline of the next low budget slasher flick. Phantom worlds are on the prowl; ghosts dance in exoplanets’ atmospheres; entire worlds are even having their guts ripped out! Welcome to the world of Exoplanetary Horror, a rundown of the scariest alien worlds likely to frighten even Captain Jean-Luc Picard back into his shuttlecraft. The majority of exoplanets discovered thus far are gas giant worlds, often many times the size of Jupiter. Sometimes these worlds will orbit so close to their host stars that they are called “hot-Jupters.” So, if you were an alien creature living in the gaseous atmosphere of one of these hellish worlds, where would you hide to get away from the searing heat? Well, you’d navigate away from the star, toward the night-side of the exoplanet, right? Bad move little floating alien! An exoplanet recently discovered by the Spitzer space telescope discovered a mysterious “hot spot” in its atmosphere, a full 80 degrees offset from the star. This means that the hottest part of the atmosphere isn’t on the day-side (with the star directly overhead) but toward the night-side at sunrise and sunset — where the temperatures exceed 1,000 degrees Celsius! That’s hotter than molten rock! It is theorized that this extreme hotspot is caused by ultra-fast winds blasting like a blowtorch around the planet away from the star, generating shocks that boost atmospheric heating. So, unless you wanted to vaporize faster than a vampire bathed in sunlight, that’s where you wouldn’t want to be. One would think that the only thing that makes exoplanet Fomalhaut b scary is the fact that it orbits within a dusty cloud that looks exactly like the evil “Eye of Sauron” from the epic trilogy The Lord of the Rings. But no, the alien world is more subtle than that. Conflicting studies suggested that Fomalhaut b may be a ghost as it has exhibited strange movement not fitting with it being an exoplanet. But — like the ghostly Flying Dutchman forever lost at sea, never to make it to port — astronomers think they’ve spotted Fomalhaut b adrift in its ocean of dust once more. We’ll have to wait and see until the world is either confirmed, or forever be a ghost story. Recent studies have identified a new classification of exoplanets — they’re small, rocky and have hellish orbits around their host stars. What’s more, they shouldn’t even exist. Kepler-78b is one of these worlds that orbits a star some 400 light-years away. It is of the approximate size and mass of Earth and likely contains an iron core. But that’s where any similarity ends. This is a lava world, suitable only for fire-dwelling demons, or the devil itself. Interestingly, there is no known planetary evolution theory that can explain these worlds. In the cult sci-fi horror flick Chronicles of Riddick: Pitch Black, anti-hero convict Riddick (Vin Diesel) crashes onto a rather unsettling alien planet infested with horrific flying bat-like creatures hell-bent on eating Riddick and the rest of the surviving crew. But it’s not as simple as that — these flying nasties only come out at night. Cue the screaming, running and killing… all in the dark. As Pitch Black proves: at night, horror comes out to play. And in the case of an exoplanet called TrES-2b, script writers’ imaginations would run wild as to what sci-fi horror could be waiting deep in its inky atmosphere. The world is literally pitch black — darker than coal. What’s more, as it orbits so close to its star, TrES-2b is tidally locked, meaning one side of the exoplanet is in continuous nighttime. I wonder how Vin Diesel would deal with that. Nobody likes stuff that oozes. Especially when it’s oozing brain matter, blood, slime or some mystery extraterrestrial fluid that inextricably likes to cuddle its pray’s face. So, on that note, welcome to 55 Cancri e! It’s a whole exoplanet that — you guessed it — oozes. It could be the home world of The Blob, or perhaps a place where the Star Trek baddie Armus likes to vacation. But why is this world oozing? As this super-Earth exoplanet has such a tight orbit with its star and observations suggest there must be a huge quantity of some unidentified liquid inside its body, any fluids that appear on its surface will likely be solvents that have oozed from below. Don’t open the Ark of the Covenant! If you remember that famous “melting Nazi” scene from the classic Indiana Jones and the Raiders of the Lost Ark, you’ll know exactly what I mean. The iconic scene included angry spirits, melting faces and the exploding head of Jones’ nemesis Dr. René Belloq. At the time, it was cutting-edge horror animation, but imagine if you faced the rage of the Ark’s spirits every… single… day. One world with a perpetual “melting face” is poor old CoRoT-2a, a world facing its own angry spirits from its host star in the form of powerful X-rays. The radiation is so strong that scientists using the Chandra space telescope think 5 million tons of material is being ripped from the world every second! If that’s not a tortuous death, I don’t know what is. Ever wanted to know what it must feel like to be boiled alive? Well, try landing on this exoplanet and you’ll quickly find out! At face value, Gliese 1214 b may not sound too bad — it’s a “super-Earth” rich in water. However, astronomers have noticed that this isn’t the kind of water you’d want to be drinking. The bone-crushing pressures and eyebrow-singing temperatures maintain this water in a plasma state, creating a dense, deadly ocean at the bottom of its atmosphere. It’s basically an extreme exoplanetary pressure cooker. “I see dead people,” said Haley Joel Osment in the 1999 ghost film The Sixth Sense when he broke the news to Bruce Willis that he has a rather unhealthy habit of seeing… well… dead people. [Spoiler!] It turned out that Willis was also one of those dead people. So, if the aurora is interpreted as the souls of the dead, spare a thought for what you’d see if you lived on an exoplanet with a global magnetic field, orbiting close to its host star. Scientists think that closely-orbiting “hot Jupiters” will experience awesome auroral displays as plasma from their nearby star floods their atmospheres. The result? Aurorae 100-1000 times brighter than the displays we see on Earth — like ghosts dancing all over the planet. Loners. Particularly weird loners with unpronounceable names. Carrying an axe. Hitchiking. Yep, that’s scary — a storyline that has been used for generations to scare the pants off cinema-goers. So, what about loner exoplanets? There are thought to be loads of exoplanets out there, but a few of them are too small and too distant from their host stars to be detected by conventional telescopes. However, sometimes, astronomers get lucky and spot one of these extra-solar loners. Take MOA-2009-BLG-266Lb for example. (Sounds like a weirdo, right?) It’s a “super-Earth” that would normally orbit its star too far away to be spotted. But, with the help of general relativity, its 10-Earth mass bulk bends spacetime just enough to focus its star’s light when seen from Earth. This is known as a “microlensing” event, and though rare, it can pick out tiny rocky worlds floating far from home. These exoplanetary loners may not be carrying an axe, but they do pose many questions as to how they evolved so far away from their stars (if they had stars in the first place, that is). When Jeff Goldblum grew spiky hair and other weird fly-like appendages in the human-experimentation-gone-wrong horror movie The Fly, needless to say, his friends grossed out. I’m sure exoplanet HD 209458b would sympathize with Goldblum’s predicament. As it’s orbiting close to its star, powerful stellar winds are stripping its atmosphere into space, creating a comet-like tail. HD 209458b must be wondering why its exoplanet friends are pointing, nervously laughing and slowly backing away. Sure, the idea of a “diamond exoplanet” may sound luxurious. Sadly, life as we know it (i.e. you) probably wouldn’t get much of a chance of walking barefoot across diamond-enriched beaches. Scientists have modeled carbon-rich worlds (as opposed to silicate-rich worlds like Earth) to find out that the carbon that formed the planets in carbon-rich stars likely sucked out all of the oxygen during the stars’ formative years. With no oxygen, water couldn’t form (a molecule that consists of two hydrogen atoms and an oxygen atom). Therefore, carbon worlds (the most exotic of which may be rich in diamonds) are dead, parched worlds with no hope for life as we know it. Bummer. And yes, this is a real phenomenon, and not just a butchered opening for a Star Wars spin-off. Some 650 light-years away, an exoplanet orbits a sun-like star called Kepler-19. The world, Kepler-19b, has a very strange orbit in that sometimes it speeds up, completing its 9 day orbit 5 minutes fast, and at other times, it will complete an orbit 5 minutes slow. This orbital weirdness is all down to an invisible world whose gravitational influence is tugging at Kepler-19b. “Transit timing variations” may sound a little spooky, but the method has since been used in other star systems to detect the presence of hidden, phantom worlds. It’s the classic cliffhanger: there’s an exoplanet, minding its own business, floating way too close to its parent star when, literally, all hell breaks loose. In the case of HD 189733b, located some 60 light-years from Earth, its star decided unleash a powerful flare that the Hubble Space Telescope was able to see. If you needed an example of the Gates of Hell opening, this is it. 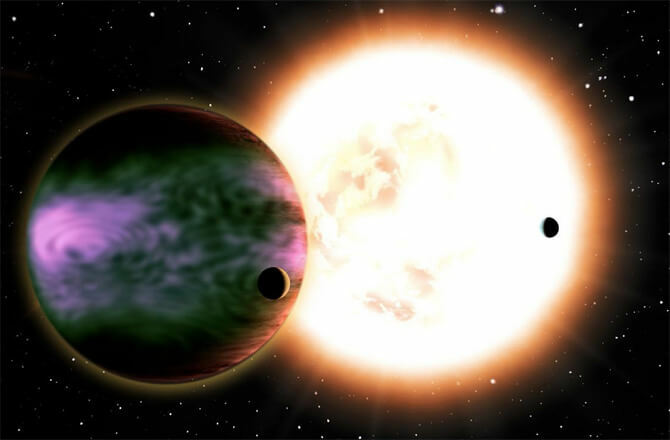 What’s more, the exoplanet suffered horribly. Hubble was able to discern massive quantities of hydrogen blast from the exoplanetary atmosphere. By astronomers’ reckoning, such powerful displays of star fury may explain why we’ve been discovering small rocky worlds so close to other stars — perhaps they are the charred husks of what were once mighty gas giants. Zombies are awesome for chopping up, shooting or dismembering. And if we’re to believe all those George Romero movies, no matter how you slice ’em and dice ’em, a zombie “World War Z”-like apocalypse is inevitable (unless you can destroy their brains quickly). So what has this got to do with exoplanets? Well, it depends how you interpret this little story, but it certainly sounds like we have a zombie exoplanet on our hands (figuratively speaking). Twelve years ago, astronomers using data from the Hubble Space Telescope thought they saw an exoplanet orbiting a star. On closer inspection, other astronomers couldn’t find the world and declared the exoplanet dead. But in 2009, it appears the exoplanet, called TMR-1C, is back from the dead having been spotted by astronomers using the Canada-France-Hawaii telescope. OK, so it’s not much of a zombie exoplanet — and it’s certainly not a reanimated corpse — it was just hiding. Sure, some exoplanets may have some horrific qualities, but more often than not it’s their parent stars that have a nasty side. Take white dwarfs — they may sound cute, but their tidal forces are living hell to anything orbiting them. When a sun-like star approaches death, it puffs up into a red giant, shedding its outer layers. What’s left is a little shining jewel of a star — a white dwarf — with any planets and asteroids that survived the stellar death. Unfortunately for anything in orbit, if they get too close, the tidal shear of the tiny star will literally shred anything that gets too close… much like a blender. Astronomers have even used the blended debris surrounding white dwarfs to decipher whether any rocky planets were once in orbit. Funny thing is, in a few billion years time, alien astronomers may be looking at the dusty remains of our planet drifting around our dead, white dwarf sun.